We have been discussing the rising intolerance and violence on college campuses, particularly against conservative speakers. (Here and here and here and here). Berkeley has been the focus of much concern over mob rule on our campuses as violent protesters have succeeded in silencing speakers, even including a few speakers like an ACLU officials and James Comey. Both students and some faculty have maintained the position that they have a right to silence those with whom they disagree and even student newspapers have declared opposing speech to be outside of the protections of free speech. At another University of California campus, professors actually rallied around a professor who physically assaulted pro-life advocates and tore down their display. In the meantime, academics and deans have said that there is no free speech protection for offensive or “disingenuous” speech. Now, CUNY Law Dean Mary Lu Bilek has a different approach. 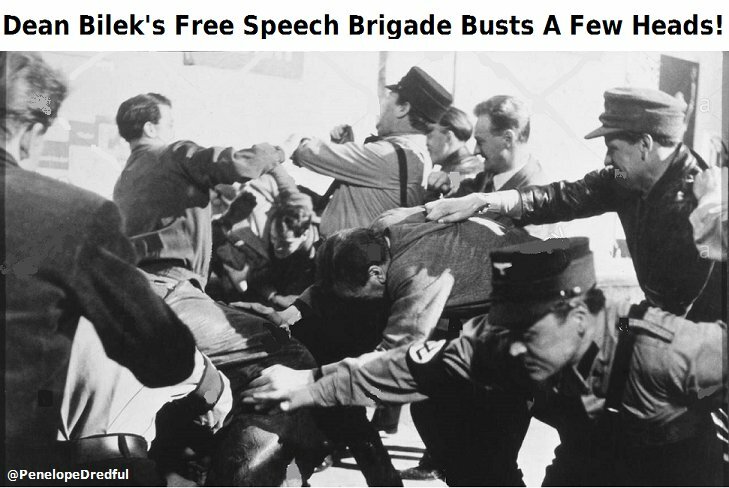 When conservative law professor Josh Blackman was stopped from speaking about “the importance of free speech,” Bilek insisted that disrupting the speech on free speech was free speech. It reveals the twisted logic overtaking our schools on both tolerance and free speech. Blackman, a law professor from the South Texas College of Law Houston, often writes thoughtful conservative takes on legal issues and was appearing at an event with the CUNY Federalist Society. While Bilek says that the heckler’s caused only a “limited” interruption, Blackman says that it was prolonged and prevented him from being able to give his full speech. Some of that is defensible, but Bilek lost me in the end. First, students clearly have a right to protest outside of the event. Stopping an event is not an act of free speech. It is the denial of free speech and should be punished by the school as such. For Bilek to say that it is not a violation of CUNY policy is alarming. Particularly in an academic setting where a variety of views and values should be allowed to be voiced, the shutting down of a presentation or speech is to deny the choice to others in exercising their rights. It is an act to prevent others from even hearing someone with whom you disagree. I recently wrote how Antifa and other college protesters are increasingly denouncing free speech and the foundations for liberal democracies. Some protesters reject classic liberalism and the belief in free speech as part of the oppression on campus. The movement threatens both academic freedom and free speech — a threat that is growing due to the failure of administrators and faculty to remain true to core academic principles. A clear line must be drawn between protesting and preventing speech. Students who shutdown classes or speeches should be disciplined and, in appropriate cases, expelled. Did Stormy Daniels Just Implicate Tom Brady? The brown shirts were practicing free speech! I’m waiting for a night of long knives. Post-modern P.C./Pure Creep millipedes ain’t fit to lick MLK’s tombstone! Let’s look at Bilek from a psychological perspective. In the 1950 there was an experiment in Cognitive Dissonance where a professor inserted some cohorts into a UFO Cult. The cult relied on automatic writing messages from its leader who said Aliens informed her that on a certain date there would be a huge earthquake, and most of the MidWest would be turned into an inland sea. And, the Aliens would come in their spaceship and save the cult members. Heretofore, this kind of stuff could only be viewed from a historical perspective (like the Millerites), but now could be observed in real time. Sooo, what happened when the earthquake didn’t happen, and the inland sea didn’t form, and the Aliens didn’t come in their spaceship??? Did the cult members admit the obvious, that they had been frigging idiots who had fallen for a silly load of bullsh*t??? Of course not! They decided that this had only been a test of faith by the Aliens! In other words, they “evolved” the belief system to include the act of disconfirmation into itself. Much less psychologically damaging to the ego! They weren’t morons! No, they were the faithful! Same thing with Dean Bilek. It is obvious on the face of it, that shutting down somebody else’s speech is Nazi-like, and fascist-like. But who wants to admit to being a neo-Nazi or neo-Fascist??? Nazis and fascists are bad people. Admitting that you do the same thing that bad people do would be damaging to the ego, sooo Bilek decides to “evolve” the behavior. Presto Change-O!, and now, shutting down free speech has become free speech! I wonder if Aliens in spaceships can save us from the Democrats??? Arrrrgggghhhhh. Sqeeky Fromm says something with which I agree!!!!!!!! Thank you for saying that! It means a lot when people who think that I am an idiot and worse agree with something I wrote! Hecker’s veto a simple enough concept and you would think a law school would be the place where adminstrators understood it. She should just be fired. Moving on now. God this angers me so much. I dont know why. It’s also discrimination against Christians not to let Christians discriminate. I don’t know how to break it to you, but every vendor who sets his custom at a particular place and every employer who hires someone, every occupational licensing board which runs an examination, and every landlord who runs credit checks on applicants ‘discriminates’. Your daughter discriminates when she turns down a date. The question is always whether or not our law is to be written in such a way as certain categories of people can call in the lawyers when others decline to contract with them. It’s your considered opinion that you should set the criteria for normal people. All liberals believe that because they are conceited and self-centered. Antifa is being bussed onto the campuses to protest at conservative events. The “heckler’s veto” is to shut down the event. A clear line must be drawn between protesting and preventing speech. You don’t get it. Deliberation occurs peer-to-peer. Academics and lawyers simply do not consider the rest of society to be ‘peers’, and the rest of society must be told to ‘shut up’ as you would an unruly child. Academics also consider those who dissent from the prejudices of the tribe to be ‘uninformed’ or addled by ‘epistemic closure’, so unsuitable a priori for positions in academe. These tantrum-throwing juveniles reflect the views of the vociferous portion of the faculty and administration. The rest are too twisted into knots by status considerations to stop it. Academe requires a Kenesaw Mountain Landis solution: whole programs get shut down by outside officials and every stakeholder is held responsible. CUNY law school issues about 140 JD’s per year, accounting for perhaps 8% of the new entrants to the profession in New York. Shut it down and the other law schools in the state can readily pick up the slack (if their is any slack; nationwide, you could cut the number of JD’s issued each year by 1/3 and the legal profession would be adequately staffed). Or take away the easy money in a broad general sense. The schools would have to adapt or get out. I would add that these student perceived convenient “inconveniences” are borne from those whom are not primarily concerned with making ends meet as well as making practical future employment goals. If the easy money dries up, it signals the end of useless degrees like “gender studies” and would make people take a longer look at the current state of the legal profession before they decide to embark on that career. Shutting down would be quicker. This is not peculiar to the left or any other perspective. This is a result of people who focus so intently on one particular facet so as to rise to a prominent level in society as a representative of that discipline, yet fail to grasp common sense perspectives along the way. Ben Carson is one example as are many of our other representatives. The logic spewed by this socially hapless individual would allow one to steal money from her purse and call it self enrichment, fondle her body parts and call it ….. It would seem that anything this professor has to offer in her field of study could easily be found online. To be an effective teacher one must partner one’s subject matter with common sense. This mutt clearly has no concept of common sense and should not be wasting taxpayer and tuition dollars. This is leaving the ridiculous level and moving into alarming. Even with all the great history and literature warning of this type of behavior, educators are still choosing to stay in their little safety bubbles. It looks like people will have to make hard choices again soon. It’s this sort of twisted logic that gave us Roe v Wade. Yes, the government should force women to stay pregnant. You know: freedom. The government ‘forces me’ not to dispatch you with both barrels, the social utility of such an act notwithstanding.